Time to 'Reach' (Climbing and Fitness) for the stars! Home Commerce Economic Development Time to ‘Reach’ (Climbing and Fitness) for the stars! There are a million metaphors for how far we can push ourselves and how high we want to go in life, but now you can get past the hyperbole and literally see how high you can climb at the new Reach Climbing and Fitness Center sitting on the edge of Bridgeport at 401 E. Fourth St.
“We love the location, we love the area, and it just made sense to put it here in the business park,” said Michael Feinberg, who owns the business park along with his brother, Alex. 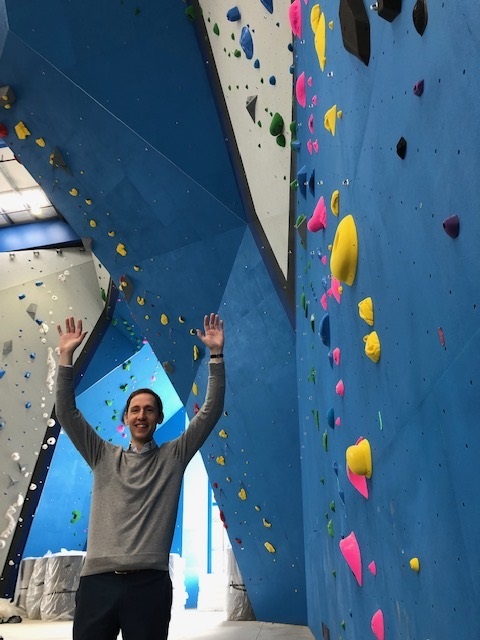 With towering walls soaring more than 50 feet into the air, the new big blue building, with an abundance of light streaming in, is destine to become home to rock climbing enthusiasts all up and down the east coast. In fact, the site will host the 2019 USA Climbing: Sport & Speed Youth National Championships July 11-14 with youth teams and more than 1,000 people attending from across the country, one of the larges events in the entire nation. Reach Climbing and Fitness is expected to have about 25 employees when they are up and running at full speed. There will be dedicated teaching and training walls, birthday party areas, advanced competition walls, and the northeast’s only Olympic-sized speed wall. So, this will be great for locals, too, who can test their skills on the same walls/routes as Olympians. Also included/featured: weight room, fitness areas with cardio equipment, training room, and yoga studio (yoga and fitness classes will be included with membership), writes Rachel Riley from Valley Forge Tourism & Convention Board.